The instructor provides 1 mannequin for every student so that you can have tons of hands-on practice. Handouts will be provided. This class is designed specifically for parents of kids ages 1 to 13. Having ambulatory little ones can be nerveracking. With potential dangers lurking around every corner, it is best to be equipped with knowledge of what to do in case of an emergency. In this two hour class, you will learn: CPR for children ages 1 through puberty, how to treat burns, bleeding, falls, and poison emergencies. Basic car seat safety for toddlers will also be covered in the session. Key measures you can take to avoid accidents and make your home safer. 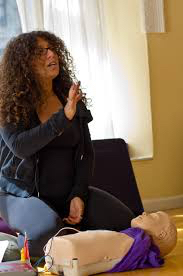 Class Details: Infant and Child CPR is a 2-hour class. Beverages and snacks are provided. Class Cost: $195 for one or two people. This includes the pregnant mom and her partner or support person. When to take: Any time in your third trimester. FSA/HSA: Most classes are eligible for FSA/HSA coverage.